Symptom: Fireplace smokes or smells. Problem: Smoking can be the result of a chimney flue that is dirty. Soot and creosote have built up on the walls of the flue effectively shrinking the flue size so that it is no longer is big enough to vent properly. Smell is usually associated with a very dirty smoke chamber, or ash pit. If the ash pit is getting wet from water it can smell really bad as it builds up mold in the ash. Also check for live or dead animals, animal nests and / or feces. Make sure the chimney has one properly sized cap that keeps water out of the flues and off the crown. Water can also come from other sources such as through the foundation (run rain gutter spouts at least 3’ away from foundation and / or dig out and damp proof the foundation with tar and / or install a dry well), faulty flashing (replace flashing), porous bricks (breathable waterproof brickwork), damaged crown (replace crown with new concrete), masonry cracks or deterioration (re-point or rebuild masonry) and flue tiles that terminate below crown (lengthen tiles to at least 2 inches above the crown). Symptom: Fireplace smokes upon start-up on cold days. Solution: Warm up the flue by opening the damper which will let warm room air into the flue then burn some newspaper behind the damper frame start your fire burning as soon as the newspaper is burned up. A top mounted damper will help to solve this problem by keeping the flue lining warm constantly. Wood stoves and inserts can have an electric warming collar installed to the exhaust pipe to heat the flue and create draft before starting the stove. Solution: To test: Open a window on the windward side of the home on the lower level (the windward side of the home can change but it is usually the same. It’s most likely the side of the structure that would get wet inside if you left the windows open while it was raining out). This will lower the level of the neutral pressure line in the structure. If this is your problem then the smoking or draft issue will stop almost immediately. Opening a window on the opposite side of the windward side will actually cause the problem to become worse. It’s also a good idea too shut off radon removal units and exhaust fans in bathrooms or the kitchen while using the fireplace, as these things will raise the level of the neutral pressure line in a structure (which is bad for things that need draft). One solution is to have a professional pressurize the house by installing either a mechanical air supply ventilator or a passive air supply ventilator on the windward side of the home near the fireplace down low and / or preferably another air supply on the lowest floor. A top damper on a lower level fireplace flue may help when it’s kept closed while using the upstairs fireplace (and not using the lower level fireplace) but we find that top dampers do not always work because the smoke can actually be drawn through tiny cracks and joints the masonry or flues. In those instances we remove the top damper and then make the upstairs flue considerably higher than the downstairs flue, there are multiple ways to do this. If there is no chimney cap we can change the flue tile top termination heights so that the upstairs flue is higher than the downstairs flue tile. Or our preferred method is to use a “flue stretcher” style cap on the upstairs flue and a regular style cap on the lower level flue. Often we will put a regular cap over the entire chimney and custom install the flue stretcher cap to come out the top of the regular cap. 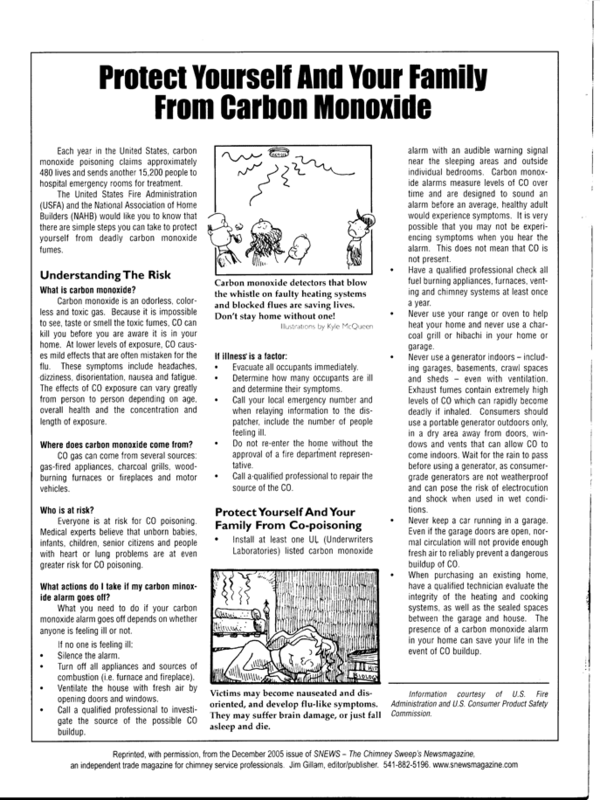 An important part of the solution is to install outside combustion air intake lines on all heating system appliances (Heating systems and vented appliances affected by a stack effect can leak carbon monoxide and other dangerous by-products of combustion into the living areas if they do not have there own independent air supply). Fireplaces should also have their own independent air supply if possible . However, I don’t recommend air supplies for fireplaces be in the firebox as this can create other issues when wind is blowing against the structure (when the chimney is on the windward side it can cause smoke to be blown into the living area or when the chimney is on the other side it can cause smoke to go backwards through the air supply). I prefer to cover all the possibilities and always do all of the following - top dampers for each fireplace (or instead of top dampers a flue stretcher on the upper level fireplace), an in cap sheet metal divider between all flues (a divider is not necessary when a flue stretcher is used and won’t work well if the flues are close together), and air supplies for everything venting in the structure (or a mechanical air supply unit). I often find (in extremely air tight structures) that each helps a little and together they usually solve it completely. Building is very air tight, combustion has used up air faster than the structure can draw in new air from outside, this causes a negative pressure in the building. Kitchen and bathroom exhaust fans also heating appliances such as heating system boilers, furnaces, water-heaters, pellet and wood-stoves all use up and compete for air which and can cause a negative pressure if the structure can’t allow air from outside to come in fast enough. Radon exhausting systems can also cause serious negative pressure issues in structures. Solution: To test: Open a window on the windward side of the home on the same level or lower (the windward side of the home can change but it is usually the same. It’s most likely the side of the structure that would get wet inside if you left the windows open while it was raining out). The smoking will stop almost immediately if this is the problem. Opening a window on the opposite side of the windward side will actually cause the problem to become worse. Also shut off exhaust fans in bathrooms or kitchen. For a better solution have a professional pressurize the house by installing either a mechanical air supply ventilator or a passive air supply ventilator on the windward side of the home near the fireplace down low and / or preferably another air supply on the lowest floor. The best solution is to install outside air intake lines on all heating system appliances and fireplaces if possible. However, I don’t recommend air supplies for fireplaces be in the firebox as this can create other issues when wind is blowing against the structure (when the chimney is on the windward side it can cause smoke to be blown into the living area or when the chimney is on the other side it can cause smoke to go backwards through the air supply). I prefer to cover all the possibilities and always do all of the following - top dampers for each fireplace, an in cap sheet metal divider between all flues, and air supplies for everything venting in the structure (or a mechanical air supply unit). I often find (in extremely air tight structures) that each helps a little and together they usually solve it completely. Symptom: Fireplace works on really cold days but smokes on warmer days. Problem: Since a large temperature difference from inside to outside increases draft effect the fireplace can work properly on really cold days even if the flue isn’t sized properly. The fireplace chimney flue may not built to the 1/10th rule. Area of the flue must be 1/10th the area of the fireplace opening A=LxW (1/12th for round flues, 1/8th for rectangle flues with a high aspect ratio and depending on the chimney’s height 1/12th to 1/18th for Cast in Place lined flues). Solution: Have a professional measure fireplace opening area, if possible reline the chimney with the proper size flue, if that’s not possible then either install a smoke guard or glass doors in the fireplace opening or an Exhausto chimney fan at the top of the chimney with an air supply ventilator on the windward side of the home near the fireplace and / or preferably another air supply on the lowest floor. Symptom: Fireplace always smokes and has since construction. 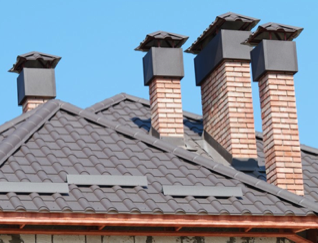 Problem: A part of the chimney may not properly sized or the smoke chamber may have improper angles. Usually the flue is not built to the 1/10th rule. Area of the flue must be 1/10th the area of the fireplace opening A=LxW (1/12th for round flues, 1/8th for rectangle flues with a high aspect ratio and depending on the chimney’s height 1/12th to 1/18th for Cast in Place lined flues). Chimney could also not be built tall enough, in which case see two symptoms below - “Smokes most or all of the time”. Solution: Have a professional measure fireplace opening area, if possible reline the chimney with the proper size flue, if that’s not possible then either install a smoke guard or glass doors in the fireplace opening or an Exhausto chimney fan at the top of the chimney with an air supply ventilator on the windward side of the home near the fireplace and / or preferably another air supply on the lowest floor. For chimney height issues see also “Symptom: Smokes most or all of the time”. Smoke chamber angles may sometimes be fixed by doing a cast in place lining of the smoke chamber. Symptom: Fireplace smokes occasionally, especially on windy days. Problem: Wind induced down drafts. Solution: Have a professional install a Wind-beater style cap. 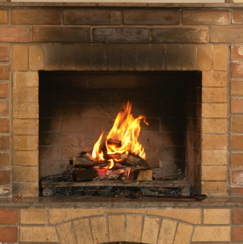 Symptom: Fireplace smokes most or all of the time or on humid days. Problem: Chimney is not tall enough to exhaust in an area of low pressure. The chimney must be a min of 3’ tall on all sides above the roof and then 2’ above any structure within 10’. Sometimes this still isn’t tall enough if other higher structures, vegetation or land elevations surround the building on one or several sides if this is the case see the appropriate solution below for correction. (For instance is the structure is built next to a cliff or surrounding by tall trees.) On humid days the air is heavier and requires that chimneys be exhausting in area of very low pressure - so the higher the chimney the better. Solution: Have a professional build the chimney to the proper code approved height, if this is still not tall enough have a professional build the chimney 2’-3’ taller than any structures, land elevations or vegetation surrounding the building or if that is not practical or possible install an Exhausto fan at the top of the chimney with an air supply ventilator on the most windward side of the home on the lowest floor and / or on a wall as close as possible to the bottom of the fireplace opening this is to help prevent the fan from causing a negative pressure on other heating appliances or fireplaces. addition on the building or a neighboring building. Solution: First, try a Wind-beater style cap. Then, if that doesn’t work try building the chimney 2’-3’ taller than any structure land elevation or vegetation that might be causing the air deflection, or if that is not possible install an Exhausto fan at the top of the chimney with an air supply ventilator on the most windward side of the home near the bottom of the fireplace opening or preferably another air supply on the lowest floor to help prevent the fan from causing a negative pressure on other heating appliances or fireplaces. Problem: If there is a chimney cap it could be emphasizing a pressure problem which is causing smoke to be suctioned down another flue (this can also happen without a cap installed on the chimney). Usually the building is very air tight, and the fire or appliance has used up all the make-up air or there is a pressure stack effect both of which cause the other chimney or flue to become an air intake duct. Solution: Sometimes chimney caps make stack effect and negative pressure issues noticeable where they were not noticed before, removing the cap and installing a mesh “roof vent guard” style cap, can end the symptoms but doesn’t get rid of the underlying issue - which is a lack air supply. 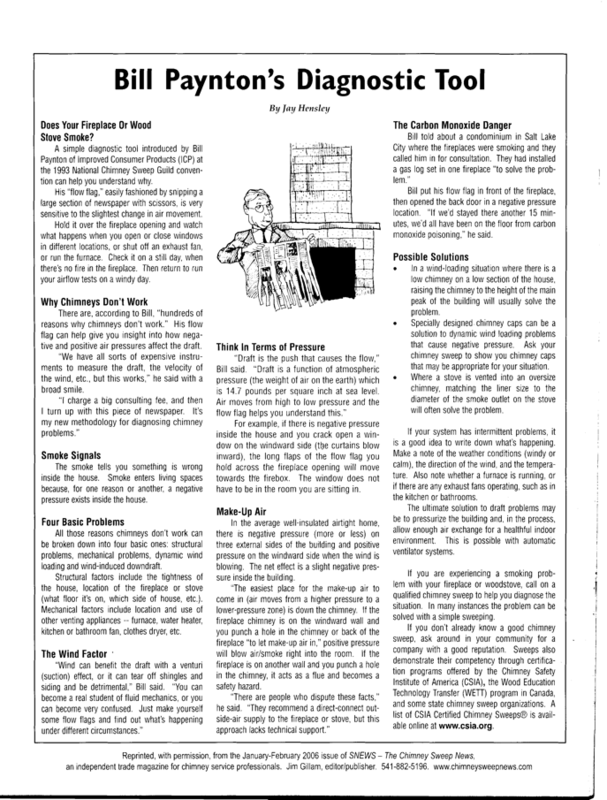 Some other symptom solutions: have a professional install top mount dampers in each flue, and / or install a solid sheet metal divider in the chimney cap between the flues or install a “flue stretcher” style cap on the flue that is not drawing smoke down it. However, it is better to address the pressure problem and have a professional pressurize the house by installing either a mechanical air supply ventilator or a passive air supply ventilator on the windward side of the home near the bottom of the fireplace opening and / or preferably another air supply on the lowest floor to help eleviate a pressure stack effect. Or even better, install an outside air intake line on all heating system appliances and fireplaces if possible. However, I don’t recommend air supplies for fireplaces be in the firebox as this can create other issues when wind is blowing against the structure (when the chimney is on the windward side it can cause smoke to be blown into the living area or when the chimney is on the other side it can cause smoke to go backwards through the air supply). I prefer to cover all the possibilities and always do all of the following - top dampers for each fireplace (or instead of top dampers a flue stretcher on the upper level fireplace), an in cap sheet metal divider between all flues (a divider is not necessary when a flue stretcher is used) and air supplies for everything venting in the structure (or a mechanical air supply unit). I often find (in extremely air tight structures) that each helps a little and together they usually solve it completely. Symptom: Smoke is not exiting the top of the chimney efficiently, and is backing up in the flue that is venting. Problem: The chimney cap may not be tall enough and / or the flue tile may be to close to the bottom of the cap lid (this can cause serious overheating and is a very dangerous fire hazard - it’s a common mistake for inexperienced chimney technicians or “do it yourself” homeowners). Or it could be that the cap is causing the airflow above the chimney to be deflected improperly. Solution: Check to see that the area of the screen and / or the area between the top of the flue tile and the bottom of the cap lid is 3x the size of the flue area, if it is not install a cap with the larger and properly sized screen height. Or if the cap is deflecting the airflow remove the cap and then install a mesh “roof vent guard” style cap (see also the symptom just above this one, if the chimney works properly without a cap). Symptom: Smoke is coming out of a wood stove in intermittent puffs. Problem: Back puffing (caused by improper wood and / or burning / loading techniques). Solution: Wood is to dry. Or, stove is overloaded with wood. Or, not enough air is being supplied to the stove (open up the intake damper). Symptom: Water heater is not drafting properly and poisonous flue gases are entering living area. Problem: Many water heaters do not vent properly in the warmer months but work fine in the colder weather, (If this is not the case then the problem may be a stack effect - in which case see the third symptom from the top of this article). This is because the temperature difference in the heating season between inside and outside increases draft effect, also hot flue gases naturally rise to cooler air above, so they easily go up the chimney and vent when it’s cold outside, but when the air above is warmer you loose this effect. Another problem is that water heater exhausts are small and can not be put into much larger flues because they loose velocity and / or they can not sufficiently heat up a larger flue enough to create draft. Solution: Install a new lining in chimney specifically for the water heater. Use a liner the same size as the water heaters exhaust collar and insulate the liner. Code allows for the chimney flue size to be up to 7x the size of the appliance exhaust collar, but this can still be to big to exhaust properly, it is always best to use as small of a chimney as possible (never smaller than the appliance exhaust collar), this increases velocity and makes it easier to warm the flue to induce draft. If other appliances are to vent in the same chimney flue THE TOTAL OF ALL APPLIANCE EXHAUSTS MUST BE CALCULATED! Too small a flue is a dangerous situation! Also make sure the connector pipes to the water heater are at as steep an angle as possible also make them as short as possible. Be sure to take out any unnecessary elbows, lengths or tees in the exhaust piping while maintaining a rise of at least ¼” over every 12”. Symptom: Furnace or boiler flue builds up debris in clean out. Or poisonous flue gases are entering living area. Problem: Chimney lining is deteriorated or there is no lining, which causes the chimney to leak and not have proper draft. (Chimney lining problems are the most common cause of this problem.) Or the chimney is not tall enough to meet code required height. The chimney must be a min of 3’ tall on all sides above the roof and then 2’ above any structure within 10’. As long as your chimney meets the minimum standard, usually height is not the issue with furnaces and boilers because the temperature difference in the heating season between inside and outside increases draft effect, also hot flue gases naturally rise, so they easily go up the chimney and vent to the outside. However if you have a highly efficient furnace or boiler the flue gases are much cooler and don’t rise as easily so both height and lining are major concerns for high efficient heating systems. Or it may be that the home is very air tight so the furnace or boiler is using up all available make up air, which will cause the chimney to work poorly or not at all. 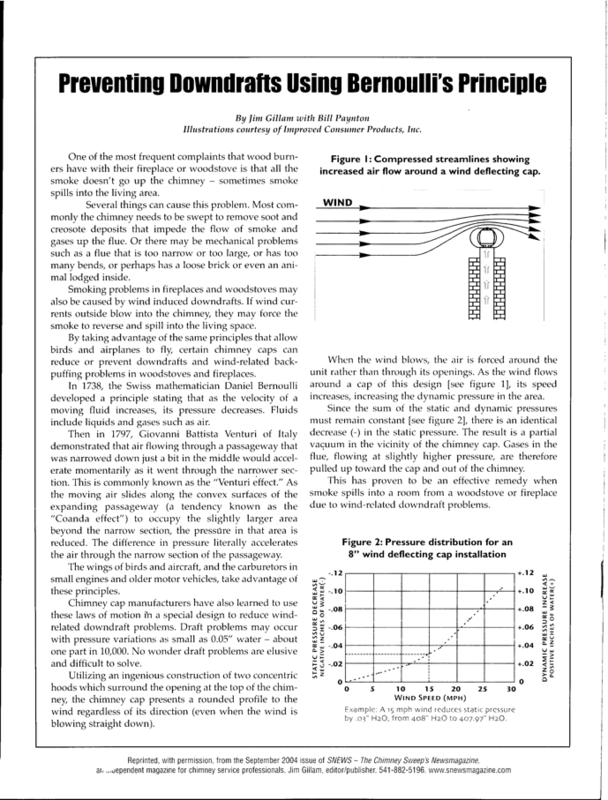 Solution: Install a new lining in chimney and new breeching pipes to appliances (make the breeching as steep an angle as possible also as short as possible) be sure to take out any unnecessary elbows, lengths or tees in the exhaust piping while maintaining a rise of at least ¼” over every 12”. Make sure the chimney meets the minimum required height. If deemed necessary have a professional build the chimney 2’-3’ taller than any structures or vegetation surrounding the building. Sometimes this still isn’t tall enough if other structures or vegetation surround the building on several sides. If this is the case, you must continue to build the chimney higher until you reach the area of low pressure above the house. If that is not possible mechanical draft inducers can be installed by a professional furnace / boiler technician, but only if there is already a liner and it is in good shape, otherwise a new liner is absolutely necessary when using mechanical draft as poisonous gases can be forced into the home through the walls of the chimney and structure. If the problem is from lack of make up air, install a outside air intake directly to the appliance (if that’s not possible use a passive system such as or an air supply ventilator mounted on the windward side of the home preferably on the lowest level or a mechanical “fan in a can” in the room with the furnace). Click here to see an example of an air supply for a forced hot air system or HVAC system (this system works best when the heating system is located in the basement or can be installed on a air return line in the basement). Click here to see an example of a manually operated air supply ventilator typically for fireplaces in a home without an HVAC system or to help when more air is required. Click here to see an example of a direct connect combustion air intake solution for use when home has an oil fired heating system.